Mus. D. HC., composer, leader and founding member of The Chieftains. Paddy Moloney is the founder and leader of The Chieftains. He grew up in Donnycarney, north Co. Dublin. His love of Irish music came from his parents’ native Co. Laois and the music that surrounded him at home. His first instrument was a plastic tin whistle and by the age of eight, he was learning to play the uilleann pipes from the great pipe master, Leo Rowsome. It was when he heard Leon Rowsome, son of Leo, play his pipes in the Scoil Mhuire school band in Marino, that he began to beg his parents to have Leo make him his very first set. After he left school, Paddy, always aware that he needed a nine to five job to support his musical hobby, took a job with Baxendales, a large building firm, where he worked in accounting. It was here he met his future wife, Rita O’ Reilly. Paddy always had a vision from his early days playing. A sound he wanted to create, a sound that had never been heard before. He knew it would take much experimentation with different combinations of instruments and so he formed several groups with other musicians in duets and trios. In particular he played with Seán Potts, Michael Tubridy and Sean Keane in various combinations who would all later become Chieftains. 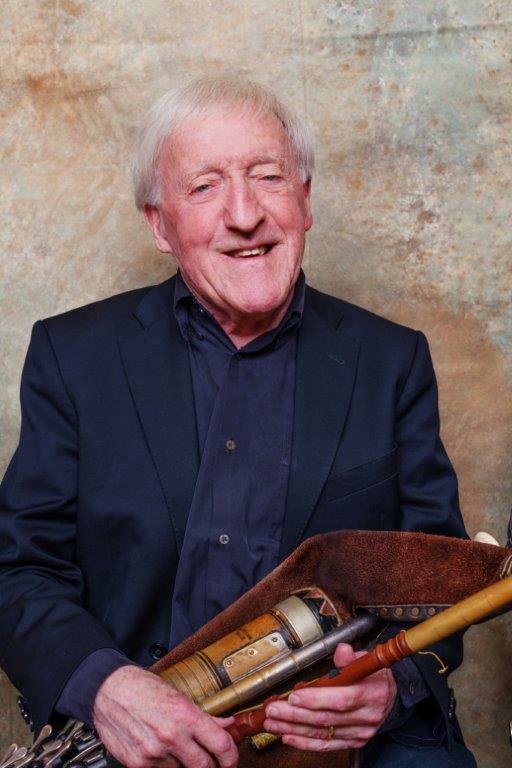 But it was not until he had formed the original line up for The Chieftains in 1962 that he finally achieved the sound that had eluded him, a sound created by Paddy’s inspired choice of instruments, styles and players. It was only at this point did Paddy feel ready to give his group the title The Chieftains (a name which was inspired by the Irish poet John Montague) and confident enough to take his band into studio to record the very first of many, award winning albums. This recording came about at the invitation of his good friend, the Hon. Garech de Brun for his record label Claddagh Records. The sound that Paddy created some 40 years ago has become the instantly recognisable sound of The Chieftains, which lives on fresh today and has always set them apart from any other traditional line up throughout out the world. It is simply the sound of The Chieftains. In 1968 and having recorded a number of albums with The Chieftains, Paddy decided to leave Baxendales to work full time in the music industry as the Managing Director of Claddagh Records. He ran the label for seven years until 1975 during which time he helped to develop Claddagh’s catalogue and also a market for it. During this time he also produced, co-produced or supervised 45 albums for the Claddagh label in folk, traditional, classical, poetry and spoken word recordings.